The most prestigious award given by the ODSC is the Al Cain Award and the winner for 2018 is Wendy Schultz! Wendy has been a member of the ODSC for 17 years. She has served as Vice President and President. She is currently on the ODSC Foundation Board. 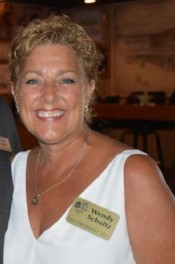 Wendy was Parade Chairman 7 years, served as Hospitality Chair in 2007 and was the Charities Committee Chair in 2012. If that was not enough, Wendy has been the Oyster Roast Co-Chair for the last 3 years and has been the Food Committee Co-Chair for the last 4 years. Wendy has also been the Chairman or Co-Chair for the Charity Fun Run for the last 3 years. As the Parade Chair or Food Committee Chairperson, it means that you do a lot of the work behind the scenes. Many trips to hardware store for the Parades and hundreds of trips to Costco and grocery stores as Food Committee Chairperson. Wendy has put thousands of hours of work in helping support the ODSC and does it all with a smile! What a worthy recipient of this award! 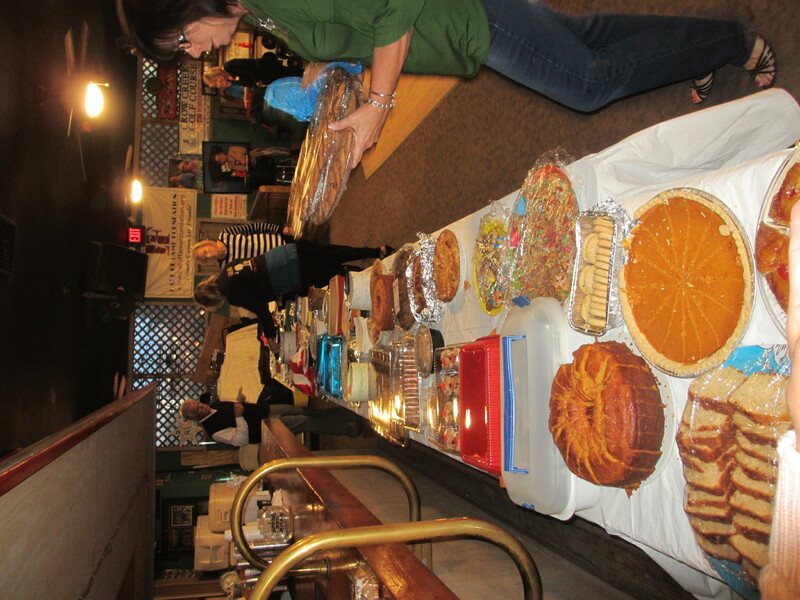 AMAZING, 320 PEOPLE (259 MEMBERS, 21GUESTS AND 40 JUNIOR SHAG TEAM MEMBERS AND FAMILIES PLUS BRENNER, ASHLEY AND TABITHA) FILLED BOTH ROOMS AT FAT HAROLD’S FOR THE ANNUAL THANKSGIVING-REUP PARTY. 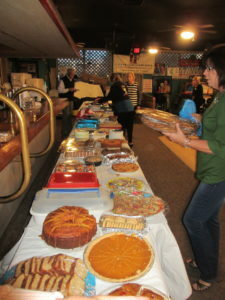 WE FEASTED ON DONNIE’S GRILLED TURKEYS, WENDY’S BAKED HAMS, DRESSING AND GRAVY AND ALL THE FABULOUS SIDES AND DESSERTS MADE BY MEMBERS. AFTERWARDS, THE JUNIOR SHAG DANCE TEAM PERFORMED THEIR PERFORMED THE DANCE NUMBERS THEY WILL BE DANCING IN CALIFORNIA. IF ONLY WE COULD STILL DANCE LIKE THAT. AFTER THEIR PERFORMANCE, A LOGO WINNER, A NAME TAG WINNER AND A 50/50 WINNER OF $176 WERE DRAWN. WE WENT HOME THANKFUL TO SHARE THIS TIME WITH OUR SHAGGING FAMILY.